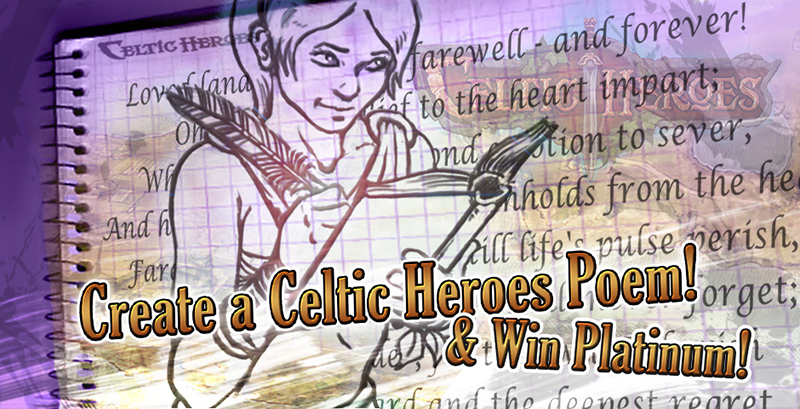 Tell the world a bit about your many adventures within Celtic Heroes...in the form of a poem that will be sung throughout the ages! I have composed the most astounding epic poem of all time! Homer would be envious! I will share it just as soon as you give me my mount from the last competition! JK! trying to be patient! K guys dont even try to entry this anymore the 350 plat been gone to this guy for sure nice work! To observe such suffering, such unease? Of which none dare to explain. You must be the one to end what began. "HAIL DAL RIATA" they shall roar! PS Thanks for taking into consideration the topic about competition diversity! YOU GO GEEBU!!!! That was amazing!!! We gather to fight through the horde. In hopes to vanquish dragon with sword. We tremor in fear, we knew what was near. A hero just looking for more! He was the man of everyone's dreams. Just so that we'd be redeemed! A man we're now proud to call king!